The Amazing Pets at the Grand Country Music Hall is one of the most fantastic shows in Branson that is sure to bring wholesome fun and excitement to kids of all ages. In this amazing show, you will see fascinating acts and tricks from a troupe of skilled dogs and trained housecats. With an amazing cast of adorable furry creatures, these pets will win your hearts as they perform for your love and laughter. Many of these creatures have been rescued from animal shelters across the country. In addition to dogs and cats, you’ll see beautiful exotic birds and many other magical surprises that are sure to amuse you. This Amazing Pets Show in Branson will leave you both laughing and amazed as the talented troupe of dogs, cats, birds and humans perform amazing acts. Throughout the show you’ll witness a number of tricks performed by the cast of amazing animals along with ringleader Sean Paul. These felines and canines and the group exotic birds bring a fantastic show that will have you rolling with non-stop fun and laughter. You will also get to enjoy a performance by a counting donkey and even performing pigs. You’re sure to be entertained as you see cats hopping through hoops, meowing, dogs riding silly bikes and barking. The impressive cast of creatures in this show is not your typical circus animals, they are everyday house pets. They perform on a show sure to delight kids of all ages. Using feline friends that are famous for only doing what they choose to perform, animal trainer Valery Tsoraev has created an amazing line-up of animals to amuse audiences with amazing tricks and acrobatic acts. Valery has performed with the famous Cole Bros. Circus of the Stars and was featured in the movie, Big Fish with his incredible cats. He cared for these fascinating creatures, including cats adopted from shelters and those that have simply wandered into his life. He taught them how to perform with human co-stars and their adoring audiences. 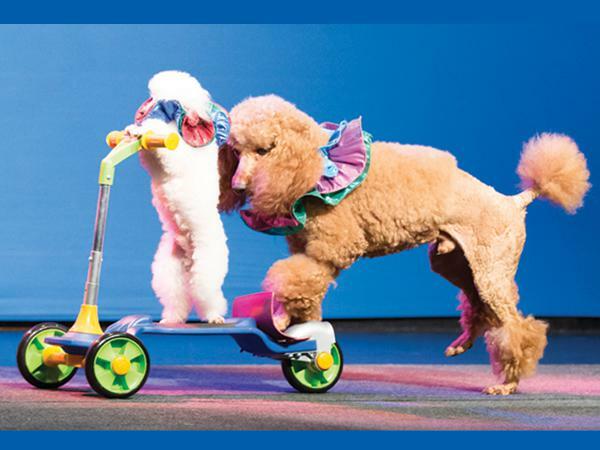 This fast-faced show features more than 30 trained amazing animals that will amuse audiences on many different feats, including riding on a bicycle and scooter, walking on two paws, and even putting on a doggie fashion show. Kids and adults alike are sure to be delighted by the tricks and amusing performances of these amazing creatures. You will see the trained house cats perform a death-defying leaps and a balancing act on high wires. A trained dog named Hercules will also perform amazing magic tricks. The show also creates a big role with magic and comedy play that interacts with the kids and come up on stage and help pets perform some tricks. This fast-faced show keeps kids fully attentive to every segment that normally lasts 5 minutes. The show truly gives every audience a unique way of entertainment. Light-hearted fun is key to this amazing show in Branson, so bring the family out for a unique way of entertainment at the Grand Country Music Hall.